Crystallizers for the plastics industry are used to assist companies reprocess their scrap PET and APET. The process of creation of items like PET bottles and APET sheet create amorphous scrap that needs to be re-crystallized. Virgin PET is usually a white color because it is in a semi-crystalline state. PET Plastic bottles are clear, but cannot be reprocessed without being returned to their crystallized state. The initial process of pelletizing either virgin or scrap PET causes a clear plastic pellet which is amorphous. Prior to creating a solid pellet, it is subjected to a high-temperature heating/agitating process. 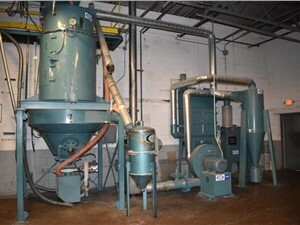 When heated to approximately 200 degrees F., the pellet crystallizes and then hardens once it goes beyond that temperature until approximately 450 degrees F. Because of the hygroscopic nature of PET, crystallizers are usually purchased and operated with large material dryers.